OLED microdisplay maker eMagin reported its financial results for Q2 2017. Revenues in the quarter were $5.3 million (down from $5.5 million in Q2 2016) and the net loss was $2.3 million (up slightly from $2.2 million in Q2 2016). At the end of the quarter, eMagin had $4.9 million in cash and equivalents. eMagin is focused on expanding its presence in military programs, advancing discussions with major consumer electronics companies for VR/AR products and progressing with finding high-volume production partners. While eMagin says that its military business is progressing and it expects to increase shipments in the future to several programs, it's main focus is in the consumer space. eMagin already signed agreements with three consumer electronics companies, and these projects are underway. Two of these required custom displays, and are paying for contract R&D. eMagin is talking with more companies and is confident that it will sign another agreement by the end of the year - with a "major CE company". eMagin is also seeking to find a production partner that will be able to produce the large number of displays needed for the consumer space - and at a lower cost compared to eMagin's low-volume production fab. One of these possible partners is AMD (AMD confirmed it is working with eMagin since 2015). During the company's conference call, eMagin's CFO said that "we actually in discussions with the joint venture where our contribution clearly would be the technology that we're bringing and also of course the process know-how". 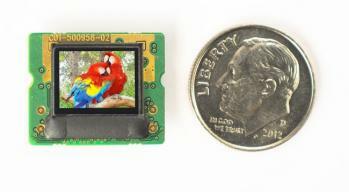 Could this be BOE and OLiGHTEK's OLED microdisplay JV? that seems unlikely as it uses OLiGHTEK's technology and have already partnered with Kopin... but you never know and eMagin could be providing its technology for the 2K direct-patterning and aims to use the production capacity financed mostly by BOE. Interestingly eMagin says very little about its own-brand consumer night-vision products. This is still on track it seems but not at the highest priority. AMD , Global Foundries , and eMagin are closely connected . eMagin leases their facilities from Global Foundries . Also interesting is eMagin's likely entry into Micro-LED . They have a patent grant (NOA issued and Fees Paid but not yet published) therefore you can only see it with modified claims on USTPO site . Here is the patent application though before some of the claims were modified . Also interesting is that Global Foundries has been looking at Micro-LED . - Architected novel micro LED based AR/MR/VR display technology, provided insight, perspective, and direction to enable differentiation and scale to CEO& Senior Executive Team. I believe eMagin is in a unique position to move foreword on Micro-LED . Oculus Research used an eMagin OLED microdisplay in their Focal Surface Display Prototype . The following should be corrected. Revenues in the quarter were $5.3 million (down from $5.5 million in Q2 2017) and the net loss was $2.3 million (up slightly from $2.2 million in Q2 2017). Correct, this should have read "2016" in the references. Thanks.